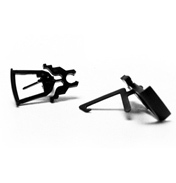 We supply a selection of train spares to help with troublesome connections and faulty couplings. 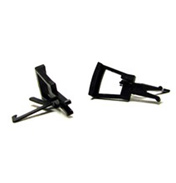 Take a look below and see if any of the spare parts can help with your model train project. 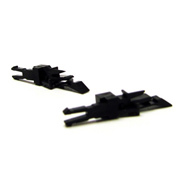 Over time the nickel on your Hornby train wheels can wear, leading to a poor track connection and obviously a low performance. 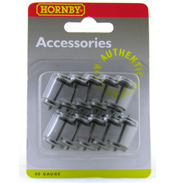 Hornby offer a range of replacement wheels and axles for many of their model locomotives and carriages. 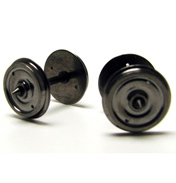 There’s solid, 3 hole and spoked wheels available, so if you’re carrying out a repair or restoration project just take a look and see if we can help. The coupling system on Hornby models can become troublesome after time. 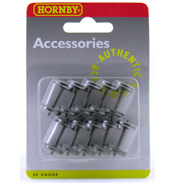 Just like any other working part it will become exhausted throughout the years, but luckily Hornby provide new couplings that can easily be replaced with the right know how. 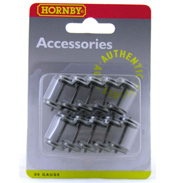 All of the are genuine Hornby parts, so you can rest assured that they’re high quality and should last for years to come.